Edenton is a town on Albemarle Sound in Chowan County, North Carolina, United States. The population was 5,004 at the 2010 census. It is the county seat of Chowan County. Edenton is located in North Carolina's Inner Banks region. 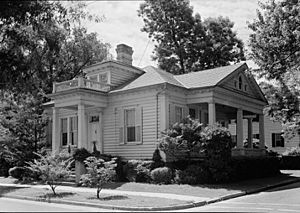 In recent years Edenton has become a popular retirement location and a destination for heritage tourism. 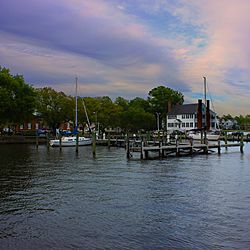 In 1658 adventurers from the Jamestown area drifted through the wilderness from Virginia and found a location on the bank of a natural harbor, the site of present-day Edenton. 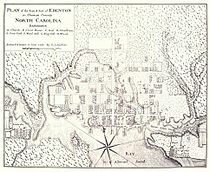 Edenton Colony was the first permanent settlement in what is now the state of North Carolina. Edenton is located in southern Chowan County at (36.061855, -76.605766). It sits at the north end of Edenton Bay, just north of the confluence of the Chowan River and Roanoke River which forms Albemarle Sound. Edenton is home to the Edenton Steamers of the Coastal Plain League, a collegiate summer baseball league. The Steamers play at Historic Hicks Field in Edenton; they began play in 1998. 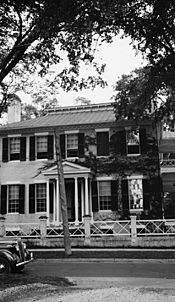 Edenton, North Carolina Facts for Kids. Kiddle Encyclopedia.